There is a truth in the Real Estate Business that gets forgotten by Agents and Brokers from time to time, and this truth causes a reduction in business growth. Real Estate Prospecting is about talking to people effectively; postcards, letters, emails, door hangers are not Prospecting – they are marketing material for a potential conversation. 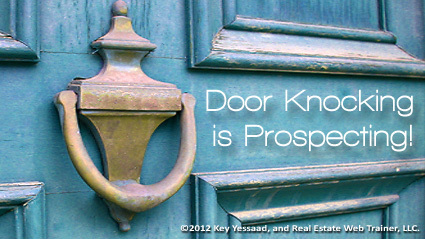 This is how you know whether you are Prospecting or not: Are you talking to Sellers about their home? And the primary means of conversations are one on one (door knocking) of over the phone (watch for the Do Not Call Registry.) And let us be honest about Door Knocking; it is not tough technically – it is tough emotionally; the fear of rejection causes many to quit too early; they then decide that working with Buyers must be a better strategy. All of your Marketing, Print, Video, Internet, and SEO must first lead to conversations; and your Long Term Business Success in Real Estate MUST be tinged by Effective Prospecting, or let’s call it what it really is: Door Knocking. Remember this obvious truth – we know where most Sellers live!